Girls of any age can be difficult to buy gifts for. At 5 years old will have started to outgrow their toddler toys, and are probably looking for something a bit more ‘grown-up’. There are so many different types of gifts for 5 year old girls. Here, we have chosen lots of different types of gifts, to make finding the perfect present easy. You’ll find toys, craft activities, personalized items and many more – there’s sure to be something your little girl will love here. We’ve also chosen gifts to fit all budgets, whether you are looking for a small, inexpensive gift for a friend’s birthday party, or a major gift for your daughter, you’ll find it here. When your little girl is 5 years old, she’ll probably be at school, or about to start. It can be a good idea to choose toys and gifts which will help with her education, or help her prepare for school life. You might want to choose something to help her with a particular skill, or an interest which she has. This could be a tech gift, such as a kids programming toy, or a sport-related gift or toy for example. Finding toys for girls age 5 years old can be challenging and daughters often want to be like their moms, so might enjoy a baby doll to look after, along with accessories to go with it. Often at around the age of five years old, girls will become interested in dollhouses. Therefore, a doll house with a family of dolls and accessories can be an excellent gift for a girl’s 5th birthday. The cute girly remote controlled dog would make a great gift for any young dog lover. It has a good range of 50 feet, and is rechargeable, meaning it won’t cost a fortune in batteries. 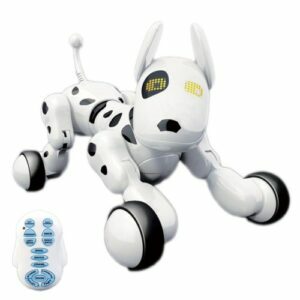 The robot dog pet has loads of fun features to keep kids occupied for hours. Its eyes light up and can change shape, depending on the mode being used. This playful RC dog toy offers several fun modes, including a learning mode. In this mode, letters of the alphabet appear on the eyes. 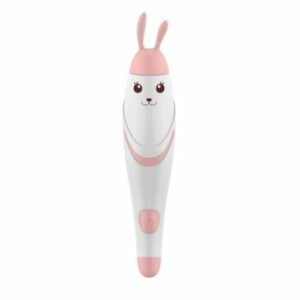 This unusual dog gift for 5 year girl can also sing and dance, and can travel in all directions using the simple remote control. This is one of the best gifts for a 5 year old girl! The kids smartwatch is ideal for children up to 9 years old. It comes in a choice of either blue or purple, as well as 2 Star Wars designs. The watch comes with several activities, games and challenges as well as a motion sensor. 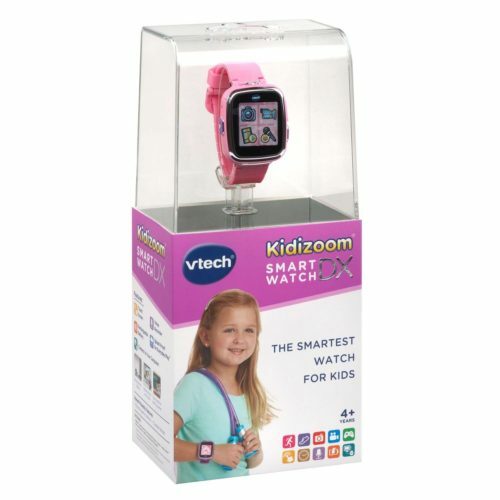 The VTech Kidizoom has a camera which can take photos and videos and voice recordings. It also has fun photo effects for kids to edit their photos. The watch also comes with useful features like an alarm, timer and stopwatch, and well as a calendar and calculator. The girl’s smartwatch can be customized with a choice of over 50 clock face styles. It’s splash proof, meaning it’s fine for outdoor play, however, should not be used for showering or swimming. The watch can be recharged, and a micro USB is included for transferring photos and videos to a PC. This interactive map is an ideal gift idea for 5 yr old girls for teaching your little girl all about US geography. 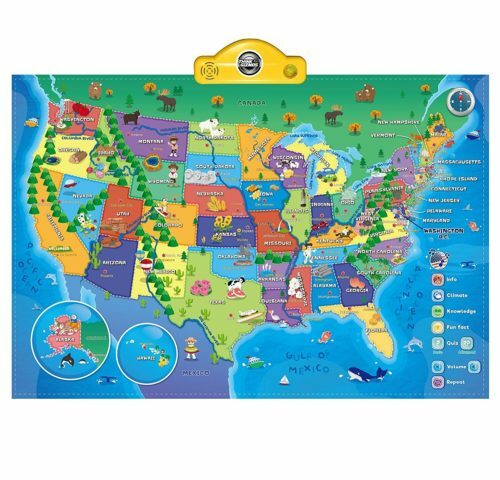 It makes learning really fun – kids will become so enthusiastic about learning after playing with this interactive, talking map. The map can be mounted on a wall, making it great for a classroom or playroom at home. The interactive wall map gives over 500 fascinating facts about the USA. It also has a quiz mode to test how much you have learned! There’s a volume control too, and the sound can be turned off altogether. It’s recommended for children over the age of 6, but by giving it as a gift early, you will help your child starting learning about their country sooner. It’s also a great activity for parents and children to share together – you can help your child learn in a fun and interactive way. 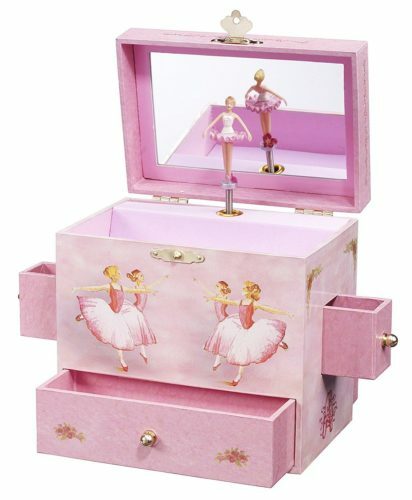 This girly sweet musical jewelry box would make the perfect gift for any little princess. It’s perfect for keeping jewelry and other little trinkets safe. The ballerina figure inside twirls around, as ‘Swan Lake’ plays. The pink girls box measures 6″L x 4″W x 6″H, making it perfect for tiny treasures. The box is beautifully decorated – it is sure to be adored by any young girl. It will look great displayed in her bedroom and will be treasured for years to come. This cute girl’s customized pillowcase would make an excellent gift for a young girl who has everything. The pillowcase is made of super soft microfiber, making it extremely comfortable to use. The design on the pillow will last for years – the design is made by dying the fabric itself, rather than screen pressing. 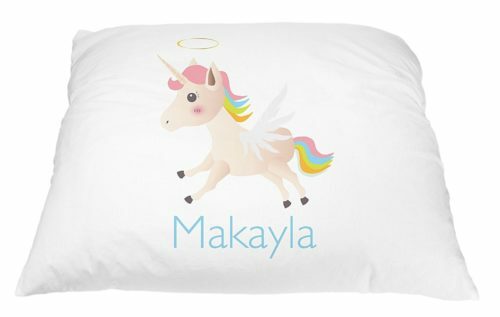 Parents with a five-year-old girl will love how easy the personalized pillowcase is to look after. They can easily be machine washed and tumble dried, and the design will still look great. The pillowcase measures 20″ x 30″, which is perfect for a queen size pillow. The name can be printed in a choice of one of 3 colors and can be up to 20 characters in length. Overall, this is a great customized gift for any little girl aged five – it will look great in any bedroom. 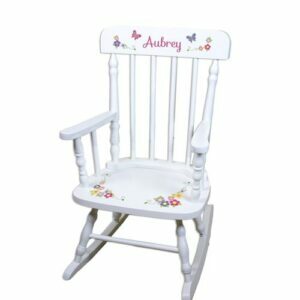 This girly children’s rocking chair would make an excellent gift for a little girl who needed her own special place to sit. It would look great in any little princess’s bedroom and can be customized with her name. There are 8 fonts to choose from and 16 different colors. The name can be up to 15 characters, meaning it’s suitable for just about anyone. The chair comes in a variety of designs, including elephants, owls, and butterflies – there’s sure to be a style to suit all tastes. 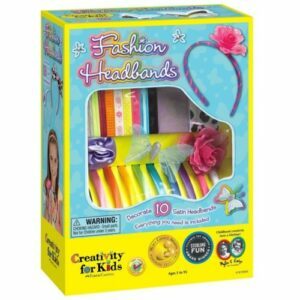 This fun craft kit for girls can be used to create up to 10 different headbands. It includes everything you’ll need to create beautiful hair accessories, including plain headbands, flowers, ribbons and a butterfly. There are 10 satin headbands in different colors, meaning your daughter can make something to match every outfit! This girls craft kit for 5 year olds is a great way for parents and children to spend quality time together. Parents will be able to help kids with some of the more difficult parts – children will love to have parents helping them with a fun and creative activity. Girls could even make bands share with their friends – it’s a great activity to do at a sleep-over! This girly fun craft activity is great for kids to make and decorate just about anything! The spray paint pen is battery operated and will last for around 40 minutes on a single charge. It comes with 12 different colored washable watercolor markers and 5 templates. These can be used to create letters, birthday and Christmas-themed drawings. The spray paint pen is really easy for young children to use – simply choose a colored pen and load it into the machine, then press the button to start the spray. The pen comes in a choice of either pink or green, and it includes a USB charger. Girls around five years old will have years of enjoyment from this art set – it can be used to create cards for just about any occasion. 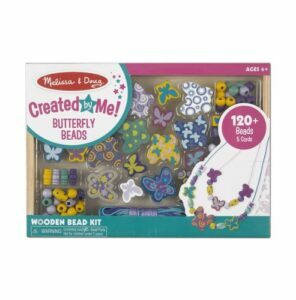 This wooden lacing beads set is ideal for little girls to create their own necklaces and bracelets. It comes with over 120 wooden beads, and 5 different colors of cords. The beads come with a wooden tray which can be used for handy storage. This girly activity is ideal for improving kids’ fine motor skills and hand-eye coordination, whilst having great fun at the same time. Little girls will love making beautiful jewelry to share with their friends and sisters. The cords in the set have sturdy eaglets fixed to the ends, meaning the beads easily slide through. The set also comes with clasps to fasten the necklaces, as well as simple instructions for attaching them. This means that young girls aged 5 years old will likely be able to do the activity alone, learning as they go. This jewelry making kit is perfect for any young girl who loves being creative. It comes with everything you need to make all sorts of different pendants and necklaces, including a 50+ page clear instruction book. The set is aimed at older kids, although we feel it would be a great gift for 5 year olds who are eager to learn and have a parent to help out. 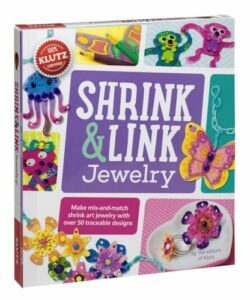 The Klutz jewelry kit comes with 5 shrink sheets, a cardboard baking tray, plastic chain, s-hooks, sequins and many more items needed to create amazing jewelry. The unique kit can be used to make traditional shrink art into something three dimensional, and wearable. The kit is a great way for kids to show of their creativity and make their own designs – the pictures need to be traced and colored in before being shrunk. This is a great toy for 5 year old girls. 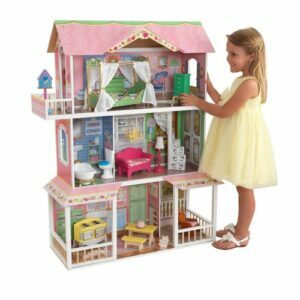 This large, 3 level dollhouse can be used by dolls up to 12″ tall. This means it’s ideal for Barbie and similarly-sized dolls. It comes with 13 pieces of furniture, perfect for finishing off every room of the house. This is one of the best toys for 5 year old girls who love dolls. It is suitable for children as young as 3 years old, but due to the large size, we feel it is more suited to those around five years old and above. The house is beautifully decorated on the interior and the sides, and it even comes with a balcony and a porch area. The dollhouse is made from sturdy wood which will stand up to years of play. 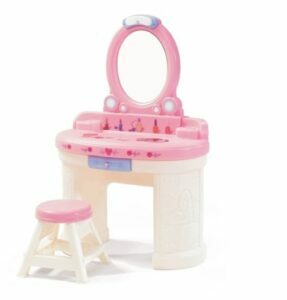 This kids vanity set is great for little girls who want to be just like their mom. The table comes with 3 accessories, a mirror, a light and a stool to sit on. The mirror is perfect for children – it is made from shatterproof plastic. The vanity set also features a small drawer perfect for storing small items such as makeup, brushes or hair accessories. The girl’s vanity set is also ideal for dressing up play. Girls will love to play princess imaginary games using this sweet set. The light has a useful automatic shut-off after 5 minutes, meaning it’s perfect for kids who sometimes forget to switch things off. The table will continue to be used for many years – it is the ideal size for girls aged five years old up to around 8 years old. The stool is 11″ high, and the table measures 14 x 28 x 41 inches. It’s also light enough to easily move around the house, yet sturdy enough to withstand daily use. This LEGO Friends set is ideal for young girls. It contains over 280 pieces, including 2 mini-doll figures, 2 puppies as well as pet toys and accessories. This girls LEGO set is for 6 to 12 year olds, although we feel that younger children will enjoy it with a bit of help from parents. It comes with easy to follow instructions, so even girls aged 5 year olds should be able to build some parts alone. After the set is built, it will provide hours of playtime fun which is ideal for young girls who love to play with doll and animal figures. 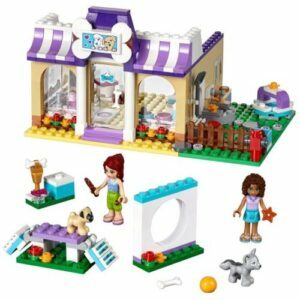 The LEGO Friends set is compatible with standard size LEGO, making it an excellent addition to any young girl’s collection. 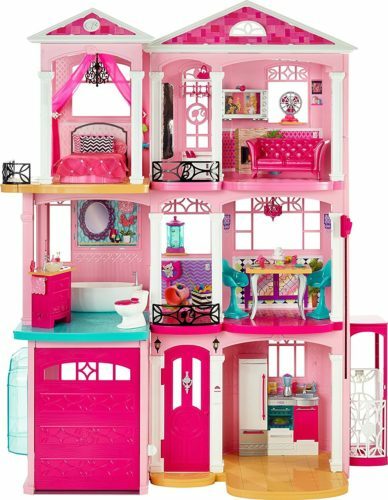 This Barbie Dreamhouse is perfect for young girls who love playing with dolls. The full-size house allows little kids to play inside along with their dolls – it stands at 5′ tall. The house comes with repositionable stickers, for girls to decorate the house in any way they choose. The large Dreamhouse is made from strong cardboard which is fully printed with stylish Barbie decor. The pieces easily join together, and it can be taken apart for easy, flat storage. 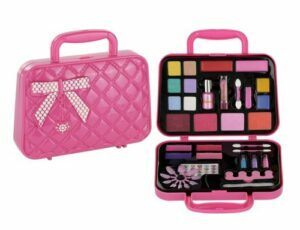 This is a great first make up set for any young girl aged 3+. It includes everything needed for a makeover, such as an eye shadow, lip gloss, glitter powder and a nail filer. Everything comes stored in a 2 compartments, perfect for traveling or taking to a friend’s house. Little girls will love pretending they are a princess with this make up set. It can easily be washed off at the end of the day and is safety tested to ensure it won’t cause irritation on the skin. Girls will love to give their friends, sisters or mom a makeover with this fun set. There are so many different items included, it will last for a long time and can be used to create many different looks. This a great toy for girls aged 5 years old and above. This female superhero doll set is great for little girls who love dolls, but also love superheroes! It combines the best of both – all the fun of playing with dolls but with fun action poses outfits and accessories. Each action figure stands at around 6″ tall, making them the perfect size for combining with many other playsets and figures. The girl’s action figure set includes 9 popular female superheroes, making it the great way to start a collection. Each figure is highly articulated, meaning they can be made into all kinds of different poses. Therefore, they are perfect for imaginative play. The large set is perfect for little girls to share with friends or siblings – there will be no more fighting at playtime with this great collection. 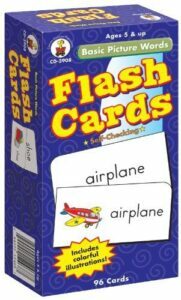 This flash card set is perfect for children who have just started school. They are great for teaching early reading skills, in a fun and simple way. Parents and children can spend quality time together learning and playing with the cards – a great way to help kids learn more effectively. The flash cards feature more advanced words than some other sets, including words around 7 to 8 letters long. Each card is double-sided, with the word only on one side and the word and picture on the other side. The words are printed in an easy to read font, along with a clear image. This makes it easier for kids to learn and remember, ideal for young children around 5 years old and above. The flash cards are a great educational gift for children aged around 5 to 7 years old. They are perfect for those who are just beginning to learn to read. 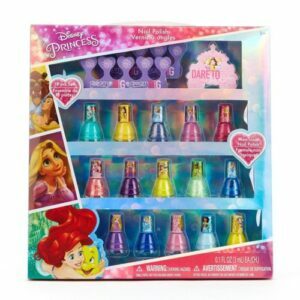 This Disney Princess nail polish set is perfect for little girls who want to have a manicure just like mom. The set includes 16 different colored polishes, as well as a few accessories. Each bottle has a favorite Disney Princess on the handle, perfect for any little Princess fan! The nail polish colors are very vibrant, and there is a great selection of different shades. There’s something to go with any outfit in this set! The nail polish does not stain fabrics like ‘adult’ versions, and it is much easier to remove too. Simply peel the polish off when it is no longer required – no need for removers or chemicals. This is ideal for young children’s delicate skin and nails – they won’t become damaged by using these nail paints. This cool girls quiz card set would make the perfect gift for a young child who is in kindergarten. The cards are used and recommended by teachers, meaning you can trust the quality. The questions are based on the curriculum, meaning they are great for supporting what kids have learned in the classroom. 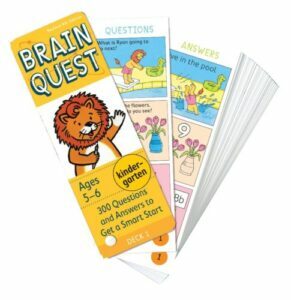 The Brain Quest Kindergarten cards have 300 questions and answers, meaning hours of quizzing fun. Parents and children will love making question and answer sessions a part of their daily routine. You can choose to do just one card, or several, depending on the attention span of your child or the time you have available. As your child grows and learns, there are several other difficulty levels which can be used to help their learning and mental development. Kids will never get bored of playing with this fun and educational game. 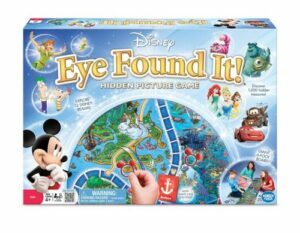 This is a great Disney themed board game for children aged 5 years old and above. It is great for helping kids learn about teamwork – either everyone wins together, or no one wins. This is great for preventing arguments among younger children in particular. The kids Disney board game features a large, 6′ board making it ideal for playing on the floor as a family. The object of the game is to find hidden treasures on the board (there are over 1000 to ensure the game can be played several times without getting easy), within a time limit. This means the game is great for encouraging observation and attention to detail – ideal for those who have just started school. The girls’ board game is ideal for the whole family to enjoy together at game night. Kids will continue to enjoy it for many years and can play with friends rather than parents as they get a bit older. This kids’ tennis kit comes with everything you need to set up a tennis court and have a match. There’s a net, 2 racquets, an inflatable ball and 3 transitional tennis balls. There is also a carrying bag to keep everything neatly stored after a match. 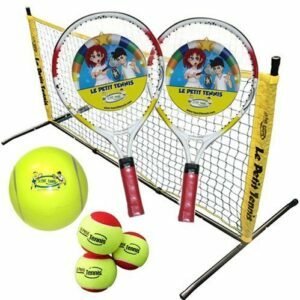 The tennis set is the ideal size for children aged 3 years old and above. The set is lightweight and portable, meaning it can easily be stored away when finished or taken to the park to play. The net is 5′ long, and the inflatable ball is 6″ – large enough for young kids to be able to hit easily. There’s also a pump to quickly inflate the ball. The whole set is really easy to set up means you can have a match straight away.